Isn't it wonderful that poet extraordinaire, Tabatha, is hosting our round-up this week at: The Opposite of Indifference ? I learn something new and poetical every time I visit. I've so enjoyed the History of American Poets series by Renee LaTulippe and Lee Bennett Hopkins at No Water River. Episode 2 was about poets of the 1930s. Aileen Fisher is highlighted in this episode. I'm so taken by her poems, I decided to take her as mentor for my writing this week. Fisher's poetry is deceptively simple--manageable for kids but strong as any grownup's. to my feet on the ground. up in the balcony seats. I read Kimberly Hutmacher's post last week, Poem Under Deconstruction with interest. She described how she takes a poem apart to look at its parts. And, she shared a poem by Aileen Fisher as an example. or a fish in the sea? Book page turning makes a swish. Mother's pointer-finger shows a shhh. Curious mouse clicks through a database. Language learners call hola, hello! meraba, bonjour, salaam and ciao! Librarians ask, may I help you? Patrons ask a question or two. Romance book club is weeping again. and tap on titles in shelves of Fiction. a library is full of most interesting sounds. Look at this beautiful handmade poetry post card from Christie Wyman. I love how her love of nature is so much a part of her poetry. Thank you, Christie! And I'm loving this couplet; Story time audience claps at The End / Romance book club is weeping again. Impressive, Linda! What a creative burst of energy you've captured in this post. I enjoyed the recently shared Aileen Fisher poems as well and love your inspired poems. Gotta love those "footsy fingers" and all those library sounds! Oh my, Linda, I think we could call you the second Aileen Fisher. These are wonderful. There is much to love, but my favorite is "low front row"-perfect! And yes, Christie's poem shows that love very much. up in the balcony seats." LOVE! The word play and the rhythm are fantastic. Well, I couldn't help but take a peek and wave at my toes...barefooted is second nature (so to speak!) Love your toes poem. 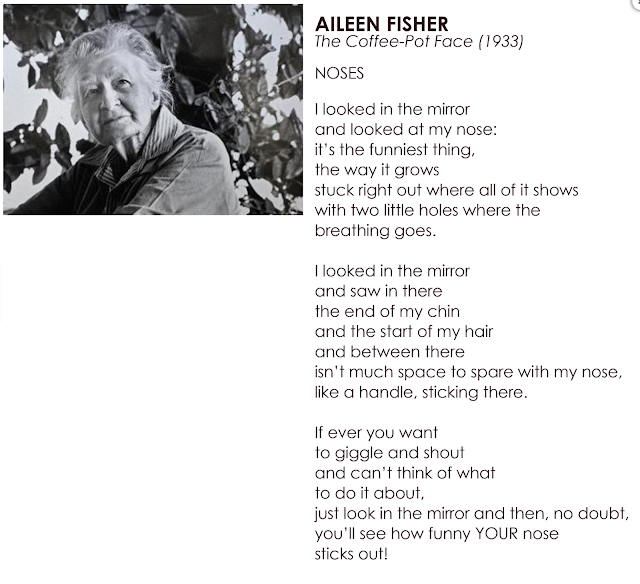 Aileen Fisher has always been one of my favorite poets, and always had a presence in my first grade classroom. I enjoyed your poems! Love the phrase "footsy fingers!" I too, love Fisher and am studying poets' work as mentors for my own writing. Today I shared a poem of mine for the first time. And it was inspired by Amy LV! Aileen Fisher is such a great mentor. I love what you did with the library poem. Relatable. Enjoyed the AF poems you shared and your own responses. A great mentor to be sure. The library poem is so clever and I'm sure your toes have never felt so loved and appreciated. :) Fun! Thanks for making me laugh with the first Aileen Fisher poem, Linda. My head is pounding from sinus pain so any humor soothes my aches. I think what you did with your poetry based upon Aileen Fisher's poems is wonderful. I really enjoyed the library poem and your toes' poem was a good use of word choice: up in the balcony seats. Aileen was right-- noses ARE funny, aren't they? Like Sara, I love "wave from furthest reach/of me to my messy hair/up in the balcony seats." Hooray for Aileen Fisher and for the poems she inspired! I love those "footsy-fingers" and your library poem is wonderful. I hope you're going to post it in your library! Well done, Linda! I've loved Aileen Fisher for a long time. Love what you did in response to her poems! What a great way to learn and stretch. Your toes poem is spot on! I do not know the poet Aileen Fisher, so thanks for sharing her with me. But I have to say I like your versions better. Love the looking at your toes, so happy and whimsical, and the sounds of the library is delightful, too. Learning from master poets is satisfying. Heidi did this as well this week. I'm inspired to learn from both of you. Loved the whimsy of Fisher's poem and yours, Linda - both made me smile...and now I want to write one of my own, too :). in a low front row." I love the specific details of both poems. Thank you! That last stanza of "Toes" is spectacular. Good old Aileen Fisher. Such a rich and fun post Linda, love your "Toes" poem. I think I wrote toes poem a while back, if it made it out of one of my notebooks and onto my computer I'll send it to you. And love all those behind the scenes sounds coming from your "library" poem too, thanks! Love your Aileen Fisher inspired poem. So fun! Usually, when I think of the library, I think of it being so quiet, but you found so much onomatopeia- so many perfect sounds for the library. Thank you for sharing!